Onion flowers are a beautiful addition to serving plates and centerpieces for Easter and other spring events. The white onions provide a basic backdrop for vibrant colored centers made out of other carved vegetables, such as carrots, tomatoes or yellow and purple cauliflower. Learning to create onion flowers is super easy. 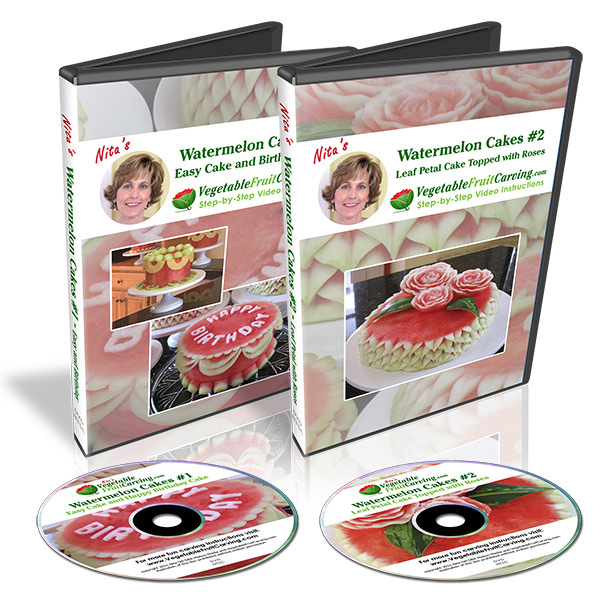 It’s also the first lesson in my Vegetable and Fruit Carving 101 course or is available as a separate lesson. 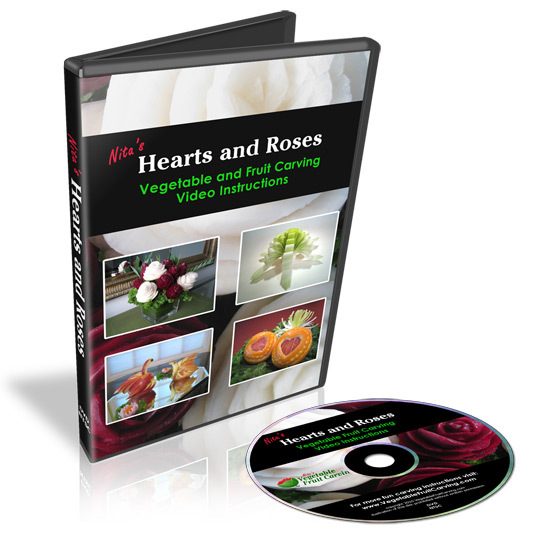 In the video, you’ll learn how to carve the onion flowers and use them as either a garnish or as part of a veggie bouquet. Simple onion flowers can be a pretty way to dress up a serving platter. Student/customer Simon Muscat sent photos of his pretty onion flowers. 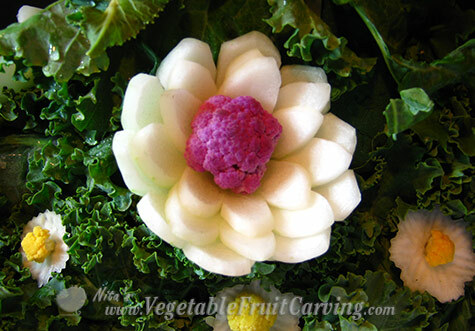 You can learn how to carve online flowers like these in our Vegetable and Fruit Carving 101 Course for Beginners. Another student/customer, Sue Bettridge, sent her photos showing how colorful cauliflower blossoms can be used for flower centers. The vibrant, purple and yellow colors work well for Easter and other Spring celebrations. 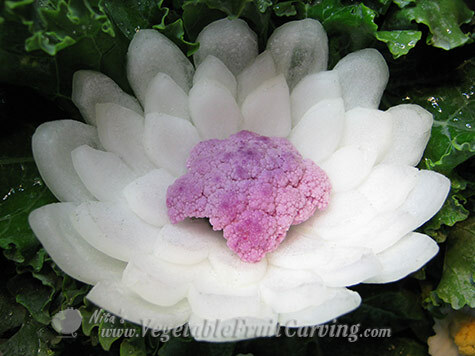 Sue used a purple cauliflower to make her onion flower pop with color. Sue made her petals curved rather than zig zag. It’s a simple variation of the same online flower shown in Muskah’s photos. Onion flowers are even more beautiful with a vibrant purple cauliflower center. 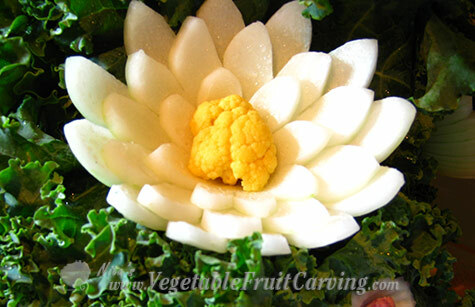 Here Sue uses a yellow cauliflower for the center of her onion flower. Since we mentioned using cauliflower for flower centers, I thought you might like to see the photo below also. 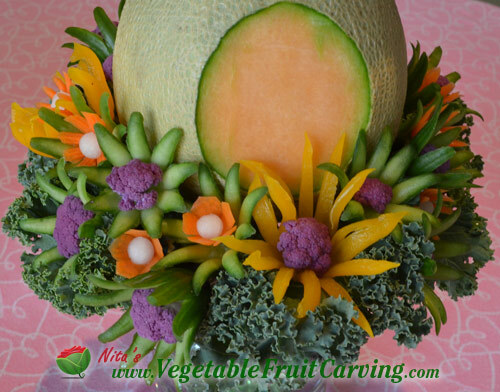 The flowers below are made from Persian cucumbers, mini-yellow bell peppers and carrots. The centers are colorful purple and gold cauliflower like Sue Bettridge’s centers for her onion flowers. 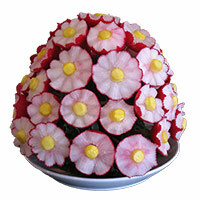 To see the entire centerpiece, of which the flowers were a part, see our Easter Centerpieces article. Customer/student, Muskah Fedaie, sent me a couple photos of onion flowers. 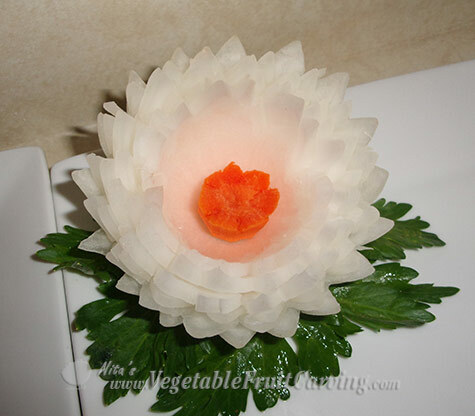 The first features a carved carrot for the center of the flower while the second shows a tomato in the center. Muskah’s onion flower with a carrot center. 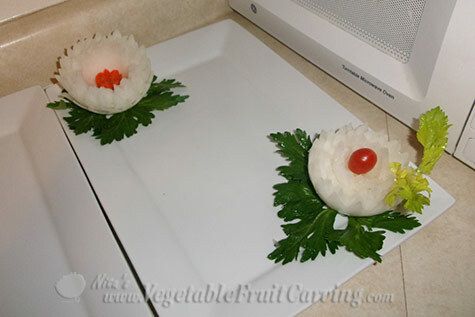 Two onion flowers by Muskah, dress up a serving platter. These are just a couple of ideas that you might enjoy using for garnishes for your Spring platters and centerpieces. 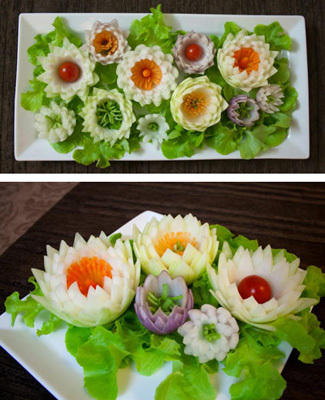 Have fun making your own onion flowers. How do you keep the onions from smelling? I often found it not to be a problem. Seems unpredictable when the onions will be strong smelling onions versus not. Even among the same type of onions. Sorry that I don’t have a sure fire method for you.